Technology is wonderful—when it isn't in the way. Despite claims to the contrary, technology can only do so much. Alternatively, if you like, it’s wonderful when it isn’t in the way, to paraphrase Steve Hogarth of Marillion. Over the past ten or so years, we’ve seen vinyl sales increase. Despite premature claims of its demise, the physical book isn’t dead yet. Independent book stores are popping up. Moleskin notebooks are all the rage. More and more artists are going “old school” and reverting to analog technologies. 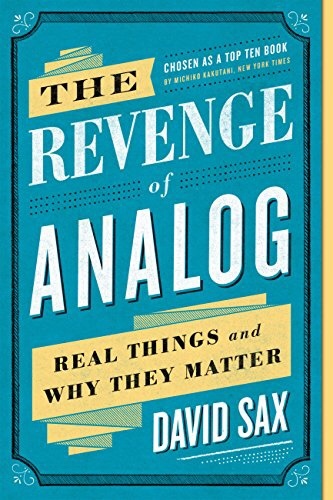 I was curious about this trend so I sat down with David Sax, author of the excellent new book The Revenge of Analog: Real Things and Why They Matter. Disclaimer: His publisher sent me a copy of the book gratis without further obligation. Listen to our conversation below.